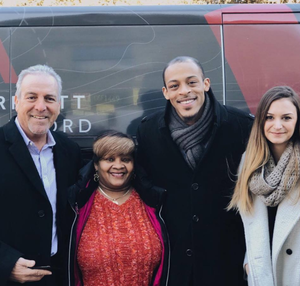 After completing a successful winter Coat Drive benefiting Person-2-Person (P2P), a community-supported nonprofit with locations in Stamford, Darien, and Norwalk, the Stamford Marriott Hotel & Spa, was able to make a rewarding donation to a charitable agency that provides emergency assistance for basic needs, and support for individuals and families. Did you know? Giving back to the community into woven into the fabric of the Stamford Marriott Hotel & Spa, part of the Meyer Jabara family of hotels. “The difference between being a good business and an amazing business can be found in the company's footprints made by giving back and serving others,” says Mark Ranieri, Vice President and General Manager at Meyer Jabara Hotels. Make a donation to P2P online here.